Al Hartmann | The Salt Lake Tribune Libertad Salgado, mother of missing woman Elizabeth Laguna-Salgado, is comforted by Elizabeth Smart at news conference in Sandy on Monday, April 18, 2016, where family gave impassioned pleas for any information on Salgado's daughter's disappearance one year ago. Al Hartmann | The Salt Lake Tribune Elizabeth Smart and her father, Ed Smart, attend a news conference in Sandy on Monday, April 18, 2016, for Libertad Salgado. Salgado's daughter Elizabeth Laguna-Salgado disappeared one year ago. 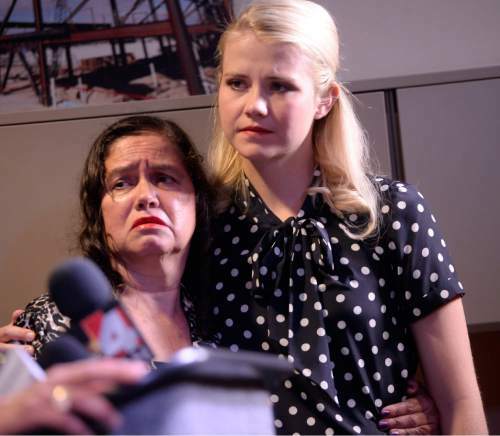 Al Hartmann | The Salt Lake Tribune Elizabeth Smart speaks on behalf of Libertad Salgado, mother of Elizabeth Laguna-Salgado's disappearance at a news conference at Rio Tinto Stadium in Sandy on Monday, April 18, 2016. Rosemberg Salgado, her Uncle, left, is Laguna-Salgado's uncle. 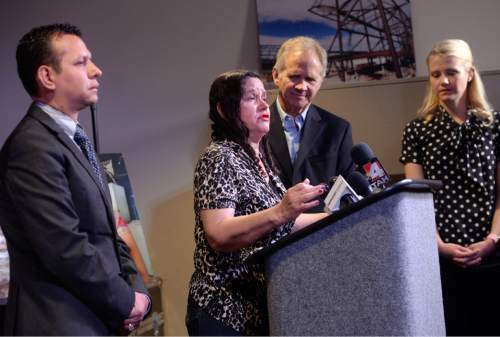 Al Hartmann | The Salt Lake Tribune Libertad Salgado, mother of Elizabeth Laguna-Salgado gives an impassioned plea for any information on her daughter's disappearance one year ago at a press conference at Rio Tinto Stadium in Sandy Monday April 18. Ed Smart comforts her. 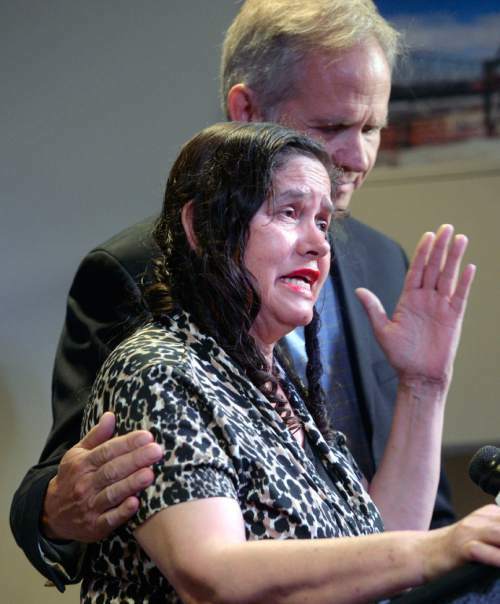 Al Hartmann | The Salt Lake Tribune Libertad Salgado, mother of Elizabeth Laguna-Salgado gives an impassioned plea for any information on her daughter's disappearance one year ago at a press conference at Rio Tinto Stadium in Sandy Monday April 18. Rosemberg Salgado, (her Uncle), left, and Ed and Elizabeth Smart pleaded to keep the case in the news and for anyone with information to contact the family or Provo Police. Al Hartmann | The Salt Lake Tribune Libertad Salgado, mother of Elizabeth Laguna-Salgado gives an impassioned plea for any information on her daughter's disappearance one year ago at a press conference at Rio Tinto Stadium in Sandy Monday April 18. Rosemberg Salgado, (her Uncle), left, and Ed and Elizabeth Smart pleaded to keep the case in the news and for anyone with information to contact the family or Provo Police. 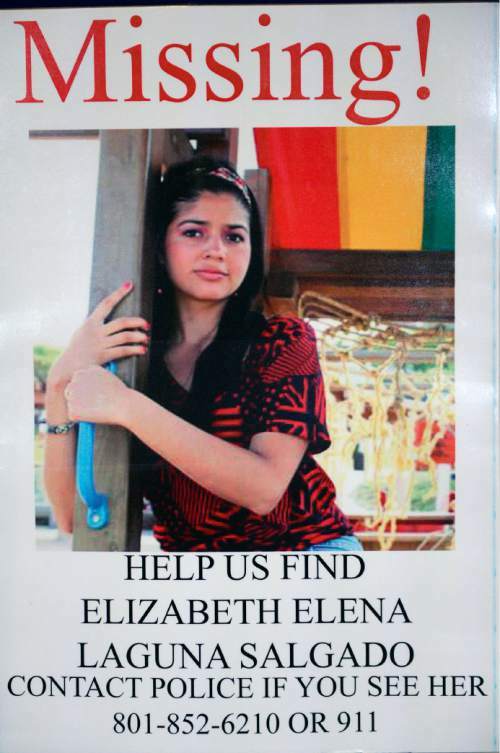 Al Hartmann | The Salt Lake Tribune Elizabeth Laguna-Salgado was reported missing one year ago. Rosemberg Salgado, (her Uncle) and Ed and Elizabeth Smart pleaded Monday, April 18, 2016, to keep the case in the news and for anyone with information to contact the family or Provo Police. Al Hartmann | The Salt Lake Tribune Libertad Salgado, mother of missing Elizabeth Laguna-Salgado is comforted by Elizabeth Smart at press conference in Sandy Monday April 18 where family gave impassioned pleas for any information on her daughter's disappearance one year ago. As part of a renewed plea to help a family find a missing woman, the subject of Utah&apos;s most famous disappearance is trying to keep the woman&apos;s name and face in the public eye. 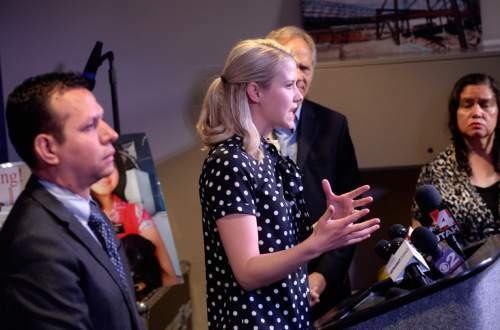 Elizabeth Smart and her father, Ed Smart, hosted a news conference at Rio Tinto Stadium on Monday to plead for information about Elizabeth Elena Laguna-Salgado, who was last seen walking home April 16, 2015, from the Nomen Global Language School at 384 W. Center St. in Provo. Anyone with information about Laguna-Salgado is asked to call Provo police at 801-852-6210 or 801-852-7307.